At Waukesha® Metal Products, providing the best value for your metal fabrication project is our number one goal. To make sure we’re meeting that goal, our facilities house a large selection of modern equipment. We use a blend of cutting-edge and industry-standard machines to ensure we’re able to fulfill on the wide variety of metal fabrication projects we receive from our customers. Our 33-ton CNC turrets, 4000-watt cutting laser, and brake presses with capacities up to 176 tons allow us to produce high quality products with minimal lead times. Our metal forming capabilities are complemented by our team of certified robotic and manual TIG and MIG welders. Our assemblers then use a variety of manual and automated assembly equipment to provide any additional value added services you need to complete your project. Top-of-the-line equipment is a necessity in this industry, but Waukesha® Metal Products also brings to bear over 40 years of experience in manufacturing. You can rest assured that our equipment is being operated by a team of experienced, passionate craftsmen who take pride in producing quality parts. 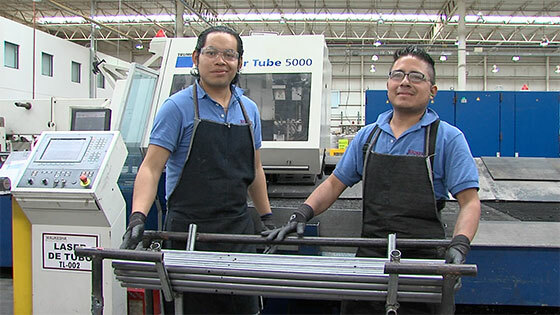 Our staff is especially proud of their ability to create custom fixtures for our robotic welders, streamlining fabrication projects so we can produce parts at affordable prices. In addition, employees at our in-house tool and die facility often assist with fabrication projects by creating custom tools, jigs and fixtures to maximize the efficiency of fabrication processes. We also pair our experience and commitment to providing the best value with our full menu of value added services. Waukesha® Metal Products provides a truly turnkey solution that will deliver the precisely finished part specified in your prints. Would you like to see our equipment in action? Watch some of our videos. You can also find a full list of our fabrication equipment below.